A couple rulings for the new Starter Deck, a new promo, and a revised Forbidden card, as well as a note about Advent Skull Archfiend’s effect. Q: There are 2 copies of Texchanger face-up in my Monster Zone. In this situation, when an opponent’s monster declares an attack on a Texchanger, can I activate the effects of both copies that negate the attack? A: As in this scenario, if you have 2 copies of Texchanger on your field and your monster is targeted for an attack, you can activate the effect of each Texchanger. In that case, their effects activate and resolve in a Chain. The effect of the Texchanger that activated as Chain Link 2 will resolve normally, but since the opponent’s monster’s attack has already been negated by the time Chain Link 1 resolves, you cannot negate the attack with the other copy, nor can you Special Summon a Cyberse-Type Normal Monster. Q: My opponent’s Evilswarm Mandragora targeted my face-up Texchanger for an attack. In this case, when I activate the effect of Texchanger, but my opponent chains Book of Moon and changes the attacking Evilswarm Mandragora to face-down Defense Position, what happens? A: As in this scenario, if the attacking monster was changed to face-down Defense Position, you cannot negate its attack with the effect of Texchanger, and you cannot Special Summon a Cyberse-Type Normal Monster. Q: Can I Special Summon a Level 5 or higher Cyberse-Type monster from my hand with the effect of Widget Kid? A: You can Special Summon a Level 5 or higher Cyberse-Type monster with the effect of Widget Kid. Note that Special Summon-only monsters such as Degrenade Buster cannot be Special Summoned by this effect. Q: My opponent activated Ojama Trio and Special Summoned 3 Ojama Tokens to my field. In this situation, during my Main Phase, can I Special Summon Cyberse Whitehat from my hand with its own effect? A: Even if there are 2 or more Tokens with the same Type on your field, you can Special Summon Cyberse Whitehat from your hand with its own effect. Q: When I attempt to Link Summon a Transcode Talker, my opponent activates Solemn Judgment to negate the Summon and destroy it. In this case, can I activate the effect of Cynet Recover that Special Summons a monster from my Graveyard? A: As in this scenario, when a Link Summon is negated by the effect of Solemn Judgment, the destroyed Link Monster is not treated as being on the field when destroyed. Therefore, in this case, you cannot activate the effect of Cynet Recover. Q: I activate the effect of Transcode Talker that Special Summons a Link-3 or lower Cyberse-Type Link Monster from my Graveyard, targeting a Pentestag. If my opponent chains Compulsory Evacuation Device, and returns Transcode Talker to the Extra Deck, how does the effect of Transcode Talker resolve? A: The effect of Transcode Talker Special Summons the targeted monster to a Main Monster Zone that Transcode Talker points to. Therefore, in this scenario, if the Transcode Talker whose effect was activated is not on the field when its effect resolves, the targeted monster is not Special Summoned and remains in the Graveyard. However, you still cannot Special Summon monsters other than Cyberse-Type monsters during the turn you activate the effect. 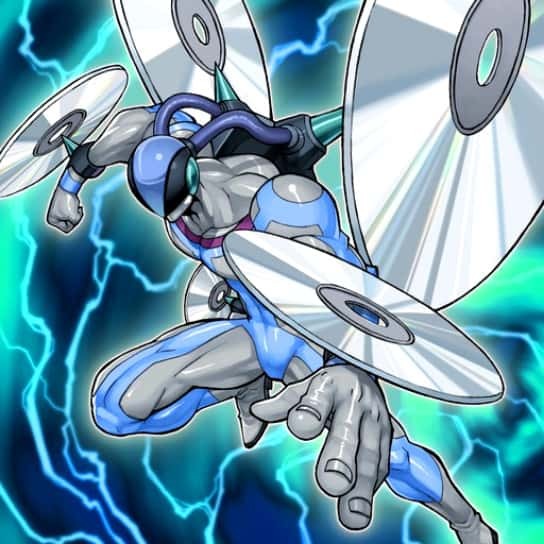 Q: My Elemental HERO Avian attacks my opponent’s Destiny HERO – Disk Commander and destroys it by battle. During my Main Phase 2 of that turn, can I activate Monster Reborn and Special Summon that Destiny HERO – Disk Commander from my opponent’s Graveyard? A: Destiny HERO – Disk Commander is a monster that cannot be Special Summoned from the Graveyard during the turn it was sent there. In this scenario, neither you nor your opponent can Special Summon a Destiny HERO – Disk Commander from the Graveyard during the turn it was sent there. Therefore, you cannot target it with Monster Reborn. Q: I activate Burial from a Different Dimension, and return my banished Destiny HERO – Disk Commander to my Graveyard. During the same turn, can I activate Monster Reborn and Special Summon that Destiny HERO – Disk Commander from the Graveyard? A: As in this scenario, if a banished Destiny HERO – Disk Commander is returned to the Graveyard by the effect of Burial from a Different Dimension, it is not treated as a monster that was sent to the Graveyard that turn. Therefore, during that turn, you may Special Summon it from the Graveyard with the effect of Monster Reborn. Q: A Ritual Summoned Advent Skull Archfiend is face-up in my Monster Zone. In this situation, if my opponent Special Summons Gameciel, the Sea Turtle Kaiju from their hand by Tributing my Advent Skull Archfiend, can I activate the effect of Advent Skull Archfiend that Special Summons a Summoned Skull from my hand, Deck, or Graveyard? A: As in this scenario, if your Advent Skull Archfiend was Tributed by your opponent when they Special Summoned Gameciel, the Sea Turtle Kaiju, you can then activate its effect that Special Summons a Summoned Skull from your hand, Deck, or Graveyard. Q: Lair of Darkness is face-up in my opponent’s Field Zone, also a Ritual Summoned Advent Skull Archfiend is face-up in my Monster Zone. In this situation, if my opponent applies the effect of Lair of Darkness when activating Grave Grinning Virus, and Tributes my Advent Skull Archfiend instead of their own monster, can I activate the effect of Advent Skull Archfiend that Special Summons a Summoned Skull from my hand, Deck, or Graveyard? A: As in this scenario, if your Advent Skull Archfiend was Tributed by your opponent when they activated Grave Grinning Virus and applied the effect of Lair of Darkness, you can then activate its effect that Special Summons a Summoned Skull from your hand, Deck, or Graveyard. At this point, it’s necessary that I call out the people writing TCG texts on an issue that will probably affect our poor Archfiend friend when it’s released here, and already has made a few cards notably worse. It has to do with how similar cards have been translated into English. If you were to look at and translate its actual Japanese text (③：儀式召喚したこのカードが相手によって墓地へ送られた場合に発動できる。 ), you’d see that its last effect activates “when sent to your Graveyard by your opponent.” That’s a bit vague, but that’s why the OCG has rulings like the ones above to clarify the details. Anyway, other cards that have this text are usually written in English to say “by your opponent’s card (either by battle or by card effect)”. Examples include Evilswam Coppelia and some Cubic monsters like Indiora Doom Volt and Buster Gundil. You can see that the parenthesized text, “by battle or card effect”, though meant to be clarifying, significantly limits the ways their effects can be triggered, particularly in the scenarios shown in Advent Skull Archfiend’s rulings above. Kaijus, Chimeratech Fortress Dragon, and Tribute Summons performed using the effect of The Monarchs Stormforth aren’t sending monsters to the Graveyard by card effects, and certainly not by battle, but following the OCG text they are still “being sent to the Graveyard by your opponent” if they use your monsters this way. So even though a Kaiju doesn’t stop Indiora Doom Volt from activating its effect following OCG text, that’s not what the TCG text implies. It’s not really an issue for cards like Beatrice and Fire/Ice Hand, which have to be “destroyed” by your opponent specifically, but it is an issue for cards that have to be sent to the Graveyard or simply leave the field because of your opponent’s card. Why this is consistently written incorrectly in English is a mystery, but it means the above rulings don’t apply to these monsters here, nor will they apply to Advent Skull Archfiend in the TCG unless they fix this. Kaijus and the like will be easy ways to get around these cards’ effects, even though they’re not supposed to be.